The White Hall Craigs: Samson is 1! I got this in an email today, but thought I would share! We are going to be there - weather and illness permitting, you? Darn...Eric has a birthday party to go to and Evan is going to a playdate since Ethan has to work. Otherwise we would be all in! HAve fun--looking forward to some more pictures! I'm pretty sure that my limited lung capacity due to this baby belly could NOT handle even the smallest of the hills at the Baltimore Zoo - and my limited patience (due to the same reason) would probably HURT someone in the crowd!! 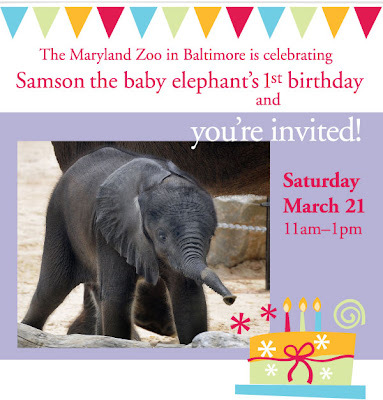 That HAS to be one of the cutest b'day invites I've ever seen! No way could I make it up to Baltimore but how cute is that? ?